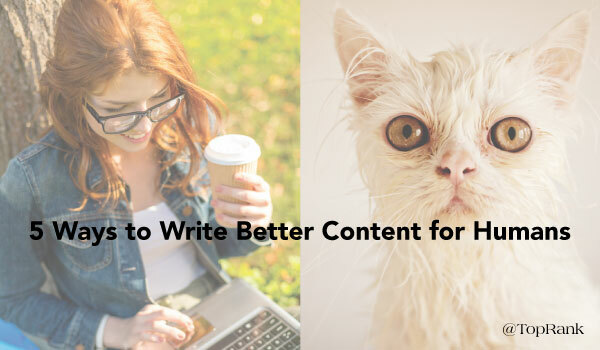 On How to Write for People: 5 Ways to Create Connections & Personality in Your Content Marketing Efforts, annhandley shared, “LOL to being your “spirit animal.” <img src="http://s.w.org/images/core/emoji/72×72/1f600.png&quot; alt="
Long gone are the leisurely evenings and weekends where people disconnected from the outside world and made time to relax. Today’s consumers are ALWAYS connected and constantly consuming information from a variety of sources. The question for marketers is: how can you capture the attention of your audience while they’re on the go and multi-tasking constantly? One of the solutions that has surfaced in recent years is incorporating podcasts into your digital marketing mix. Below we’ll dive in to three case studies MIMA social broadcasting event that uncover how different brands are working podcasts into their marketing strategy. Mobility is key. You can listen on the go in your car or the train. It’s personal. The information can be directed at the consumer. Drives Engagement. Podcast subscribers can be the core of a community who move to other key assets and channels. Busy salespeople don’t have time to read a newsletter or possibly an email. This was the dilemma for the Medicare and Retirement division of United Health Group. They wanted to share tools and ideas with their sales agents during enrollment period. Within the healthcare industry, communication is heavily regulated which means there are lots of things that they can’t do or say. Kendra Klemme, Associate Director of Communications, United Health Group, says everything has to be cleared through lawyers. So the question comes up, “How do we work within this system?” and still accomplish what we need to get done. Once cleared by the lawyers, the communications team decided a podcast was the right route to take for communicating with sales, and production happened quite quickly. The focus of the podcast was on providing the sales team with information to help them improve their approach and results. The key was providing a method for getting the sellers excited to start fast out of the gate during enrollment period. Early podcasts were produced to be anywhere between 10-15 minutes in length, making them easy to listen to for sales people in between their customer visits. From the initial podcasts that were done in 2015, UHG received positive feedback from sales leaders and agents, having reached 7K+ listens overall. Moving forward for 2016, the plan is to produce two podcasts per month – one on highlights from the monthly eNewletter, lasting anywhere from 3-5 minutes and another longer one on areas of interest to their audience. Bring the sales agents into the mix and harness some of that information. Provide best practices. Look to create additional touchpoints. If you grew up on a farm, you know that harvest season is CRAZY BUSY! Despite that fact, the Mosaic company wanted to talk to farmers during harvest about raising yields. On today’s modern farms, you will find farmers checking social media and listening to all kinds of media while they bring in the crops. In order to capture that audience, they wanted to create a podcast around “A Prairie Home Companion” meets “Twin Peaks” meets “Serial”. The result was “The Great Yield Mystery”, a 10 episode audio drama, which included a website, gamification, prizes and a trailer poster. And the result gave their existing audience something they could use. The podcast had a longer tail than they expected and exceeded interaction goals by 379%. The first podcast produced featured the creator of Cheerios. Recorded during a commercial shoot, it provided a behind the scenes perspective. This was followed by podcasts covering their monster cereals, celebrating 50 years of the Pillsbury Dough Boy, focusing on a cookbook editor and interviewing people with cooking fails, and then celebrating the 150th anniversary of General Mills. In February of 2016, the podcast will be quite topical by focusing on Super Bowl appetizers. Kevin emphasized the need to make a plan for setting-up interviews, recording, scripting, and promotion. Their posting strategy includes iTunes and SoundCloud for searchability. General Mills doesn’t make a separate show page for the podcasts, but instead includes it as a part of the blog. Audience growth takes time, so promotion is key. General Mills creates special graphics for promoting on their social channels. They also email subscribers of the blog. Does Podcasting Have a Place in Your Marketing Strategy? Would a podcast from your brand create value for your busy audience? How would it fit into your content mix? What format and length would be the best fit for your audience? The post 3 Examples of Brands Using Podcasts to Increase Sales, Offer Value & Build Audiences appeared first on Online Marketing Blog – TopRank®. We often have new customers ask us what the best approach is for breaking the code of content promotion. Is it purely organic reach, social amplification or is paid promotion the way to go? The short answer is, all of these and more. When content marketing first hit the market, brands used it as an opportunity to follow a formula for something they already knew, online advertising. Banner ads, spam emails and other forms of advertising were a precursor to the more recognized forms that we see today. In the mid-nineties, brands were spending upwards of $11,000 a week for banner advertisements. Much later, once brands began to understand the potential of content marketing as an actual way to build value and credibility (without spamming), marketing investments began to shift. Suddenly everyone was investing a large portion of their funds into creating quality content and advertising investments began to wane. That brings us to today. Brands large and small have become savvy to the fact that quality content is a must. However, the competition for the attention of consumers is becoming increasingly difficult. The mere creation of top-notch content will no longer suffice. 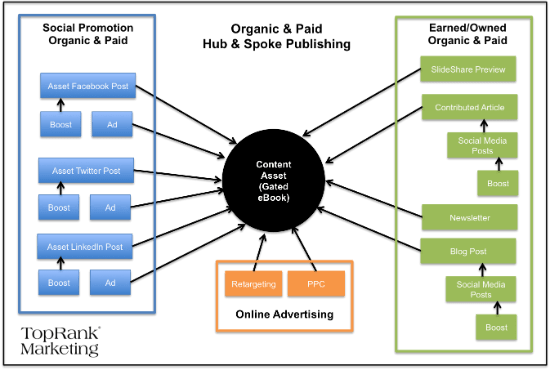 To help you decode the proper mix of organic and paid content promotion to make your content reach new heights, consider the connections below. Understanding your end objective is an essential step in determining what mix of organic and paid promotion you should pursue. For example, if your content is top of funnel and the goal is to get an influx of shares and view, you’ll likely want to invest the paid portion of your promotion in social boosting. However, if you’ve developed a great middle or bottom of funnel content asset, then you can begin incorporating pay-per-click (PPC) and other forms of advertising to convert prospects that are ready to buy. Create and promote targeted content. First of all, your content should be optimized for the humans that you want to consume, share and act on the information, as well as the search engines that you want to crawl your content. Additionally, there are both paid and organic methods to target your content promotion. For example, your Facebook and Twitter profiles may have slightly different audiences. In order to target your organic message appropriately, you’ll want to use messaging, visuals and calls to action that make the most sense for that audience. The targeting options available within search and social advertising platforms has grown leaps and bounds within the last few years. In addition to the capability of uploading actual lead lists, you can target everything from location and job title, down to the smallest detail about user habits, income and more. Need Additional Help Decoding Organic & Paid Content Promotion? Finding the exact right mix of organic and paid promotion for your content strategy doesn’t happen overnight. It is process that includes testing, some investment and often, relying on the experts to help guide you. If you need help uncovering your biggest content marketing opportunities and finding ways to make it support your business objectives, contact us today. 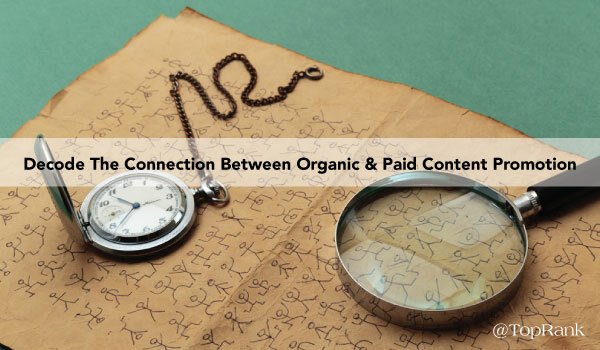 The post How to Decode The Connection Between Organic & Paid Content Promotion appeared first on Online Marketing Blog – TopRank®. Greetings, humans. It is I, a fellow human and certainly not a trench coat full of cats posing as human. I would like to tell you how to show personality in your writing so other cats—I mean, humans, like me—will enjoy reading it. All cats aside, it’s surprisingly easy for marketers to forget that we are writing for people. We write for a persona, a target audience, an industry. When was the last time an industry sat down and read a blog post over their corn flakes? By trying to write for everyone, we can end up writing for no one. As content marketers we get paid to write. How cool is that? Moreover, we get paid specifically to write engaging content that has value. We’re not writing stereo instructions here. We’re building tiny cathedrals of knowledge inside people’s heads. Let’s inspire them. Let’s create extraordinary work. That said, how far you push the following five tips depends on your audience and your brand. My advice is to go a little bit further than you think you can get away with. It’s always easier to tone it down than tone it up. End sentences with prepositions. It’s not a real rule. It never was a real rule. It’s an ill-advised attempt to impose Latin grammar on English. It leads to stilted sentences up with which I shall not put. Use the singular ‘they.’ English doesn’t have a good gender-neutral singular pronoun. 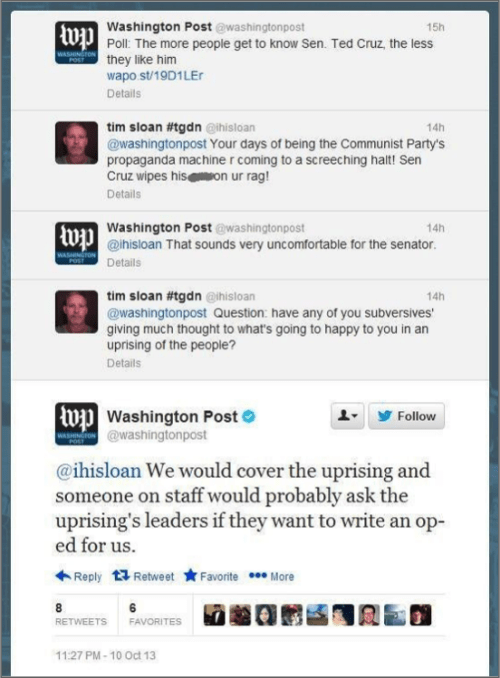 ‘They’ is a sufficient substitute, loads better than “Everyone will use his or her brains to come to his or her best conclusion.” If it’s good enough for the Washington Post, it’s good enough for all of us. Start sentences with conjunctions. My high school teachers hated it when I used ‘and,’ ‘but,’ or ‘because’ to start sentences. But it’s frequently the best way to string two sentences together. And if you do it properly, you can avoid run-on sentences. Because without sentence breaks, your reader will check out. Use sentence fragments. You’re in charge now, and it’s your job to guide the reader how you see fit. Don’t worry about making every sentence have a subject and a verb. I think one-word sentences can be so. Very. Compelling. As the saying goes, “Avoid clichés like the plague. They’re old hat.” The problem with clichés is they’re not your words. They are third-hand phrases that have been passed around so long they’re drained of meaning. A computer (or a trench coat full of cats) could assemble them into sentences. At best, a reader sees clichés as empty words that are safe to skip: “From time immemorial,” “For all intents and purposes,” “Home is where the heart is.” If you find yourself using clichés in your writing, take the opportunity to say something new. By the way, buzzwords are a special kind of cliché: They’re both new and worn out at the same time. Don’t tempt your reader to play buzzword bingo. Sometimes you can write completely naturally, but end up sounding awkward. Even though everything is technically correct, something seems off. You can reread and reread, but you just can’t put your finger on it. You wonder why this paragraph is setting your teeth on edge, and the tension just keeps building. The previous tips are text-level edits, but this one is more holistic. Too often we confuse professionalism with detachment. To really connect with your reader, be bold. You are writing to them for a reason. You know what you’re talking about. If you truly believe your advice is worth their time, embrace your writerly authority. The overarching reason great writing has personality is it breaks the rules. Think J.D. Salinger, Kurt Vonnegut, Toni Morrison. You could never mistake one’s writing for the other, and it’s all because they break the rules in their own specific ways. But before you start breaking the rules, you have to know them first. Read The Elements of Style and the Little, Brown Handbook. Understand the what and why of each rule, so you know exactly what you’re doing when you break them. Get a firm foundation in the fundamentals. Then you can go a little bit crazy on them. That’s how to develop a personal (or a brand) style. Unless you actually are a trench coat full of cats (in which case, congratulations on keeping up the deception, and you should know it’s impossible to catch the laser pointer dot), you can add personality to your content. Part of the process is unlearning bad habits from high school. Part is believing you have something important to say, and trusting that you know the best way to say it. And part is getting out of your own way, writing garbage, and refining it. So go forth and create awesome stuff. I’ll be over here with my catnip mouse. Need help creating compelling content for your brand? We’re here to help. The post How to Write for People: 5 Ways to Create Connections & Personality in Your Content Marketing Efforts appeared first on Online Marketing Blog – TopRank®. Smart, Creative and Focused on Results. That expression is central to our approach as an agency business and in our continuous pursuit to improve as marketers. Ubiquitous information access and increasing complexity and competition means the need to advance knowledge and creativity with digital marketing strategy, tactics and performance is greater than ever. There are many sources marketers can choose from to learn, grow and collaborate. Over the next few months there are multiple learning and peer networking opportunities to satisfy just about anyone’s need for marketing smarts, whether it’s content marketing, social media marketing, B2B or B2C marketing, SEO and more. To do my part, I’ll be drawing on my experiences, best practices and strategies developed during my time with TopRank Marketing to deliver presentations at 89 upcoming events ranging from webinars to events in Amsterdam, Scottsdale, London, Copenhagen and San Diego. I hope to see you at one or more! * And ensure your customer enjoy the journey, as much as they’ll enjoy the purchase. SEO is one of the top in-demand skills according to LinkedIn data and is critically important. With today’s increasingly self-directed business buyers, content that is easily found through search is even more crucial and important for marketers. This presentation will cover how smart B2B marketers are integrating SEO with content. Other topics include the importance of mobile and other recent changes with Google that B2B content marketers need to be aware of. 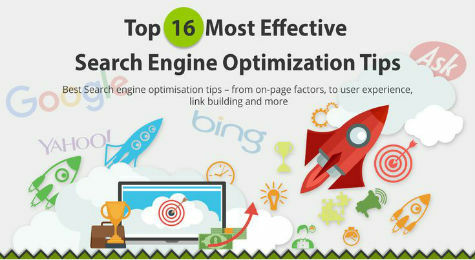 Lastly, this presentation will cover content SEO best practices. One of the most popular trends in B2B marketing is content marketing. But B2B companies are challenged to create a variety of engaging content on a consistent basis. This presentation will provide a framework for B2B marketers to scale quality content creation by partnering with internal and external influencers. A delicate balance exists between process and creativity when it comes to corporate creativity. Some fall into the trap of disregarding all process with the hopes of stimulating ingenuity, but they quickly meet debilitating chaos that actually stifles creativity. Others insist on so much structure in the creative workflow that the experience feels like working on an assembly line. What does an appropriate balance look like? How can a content marketer or a graphic designer use process to increase their creative potential? I will be co-presenting with Hana Abaza from Uberflip on the hot topic of working with influencers to co-create content for B2B marketing. According to CMI and MarketingProfs, over 90% of B2B marketers are investing in content marketing. Yet, in an age of information overload where 74GB of data are delivered per person, per day (USC), standing out to business buyers can require unreasonable budgets and resources. Inspired by the need to scale content marketing performance, a growing number of B2B marketers are creating better quality content that gets shared more often, reaches more prospects and grows their influencer network – all at the same time. In this presentation on influencer and content marketing, you will learn the best practices, wins and misses of how B2B organizations have leveraged influencer content programs to attract and engage business buyers. Are you gambling your business success with content marketing? The “shiny object” effect of content has worn off for most marketers and now it is time to for the “real” work to begin. Success with content as a means to attract, engage and convert new customers is less about a game of chance and more about working smart. This keynote presentation from Lee Odden will identify 7 key trends, brand examples and a framework you can use to win the content marketing game in 2016 and beyond. Are you winning the influencer marketing game? 84% of marketers are investing in influencer programs and some are seeing a 9:1 return, so why isn’t your influencer program a success? 61% can’t find “real” influencers and 56% can’t recruit them. Learn how to find and recruit the right influencers from Lee Odden, influencer marketing expert and CEO of TopRank Marketing. He’ll share the framework, tools, processes and recruiting tips you’ll need to make your next influencer marketing program a game winner. If you’re not lucky enough to live in Europe or the under the warm sun in San Diego or Scottsdale, no worries. There are multiple online events where you can connect and get a marketing smarts download. Just be sure to get registered soon to save your spot. As I prep for this tsunami of speaking events, I am curious: what are some of your most pressing questions when it comes to content marketing, influencer marketing, social media or SEO? Who knows, if you ask a good one, I may use it (with attribution) in one of my presentations. 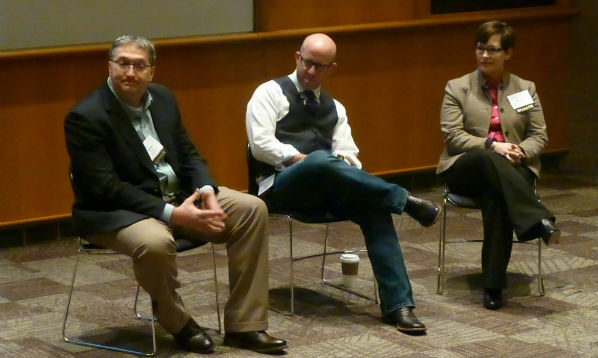 The post 8 Digital Marketing Events Where You Can Learn, Connect and Grow in 2016 appeared first on Online Marketing Blog – TopRank®. The post Online Marketing News: LinkedIn Links The UK, Google Patents Marketer Replacement, Facebook Enters The Stadium appeared first on Online Marketing Blog – TopRank®. When battling other businesses for your customers attention on social media, you have to stand out in order to get noticed. That can mean being disruptive, going against standard marketing practices, or doing something unique that draws the attention of your customers away from the “noise” of social media. One way to accomplish that goal is to harness the power and creativity of images. 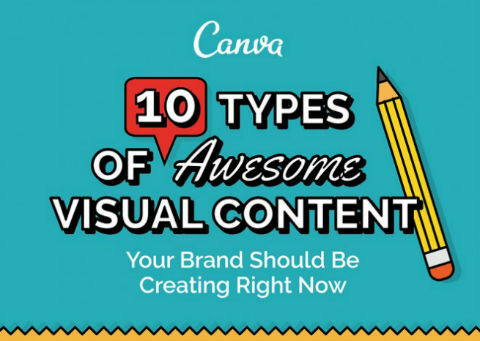 Images can make a big impact on getting noticed in a customer’s social media feed. Research has found that 90% of the information that the brain processes is visual, and the brain processes images 60,000 times faster than anything that’s read. What that means to marketers using social media is when someone is looking at their feed and scrolling through all of the posts, they are processing the images faster than the text. This post is Part 1 of a two part guide that will help you take the guesswork out of which sizes are appropriate for different platforms, as well as which tools you can use to get started quickly and with impact. What Are the Standard Image Sizes for Social Networks and Social Media Platforms? Upload images that are at least 1200 x 630 pixels for display on high-resolution devices. A minimum of 600 x 315 pixels is recommended to display link page posts that contain larger images. In-stream photo previews should be 220 x 400 pixels. Image sizes can be up to 5MB and animated GIF’s can be up to 3MB. Photos can now be shared as a portrait or landscape image instead of a square. Photos and videos should have an aspect ratio of 1.91:1 and 4:5. The ideal image size for the status update OR blog post image: 698 x 4001 pixels. Shared images on the home stream should be 497 x 373 pixels. Images shared in the feed should be 150 x 150 pixels. 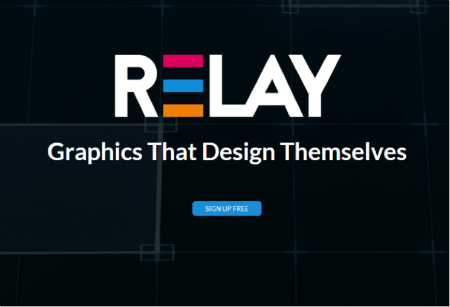 This App turns just about any photo along with text into a well-designed graphic that’s shareable on social media, as well as in text messages and emails. A great tool that can assist those who man not have a lot of time or skill in making high-quality images. 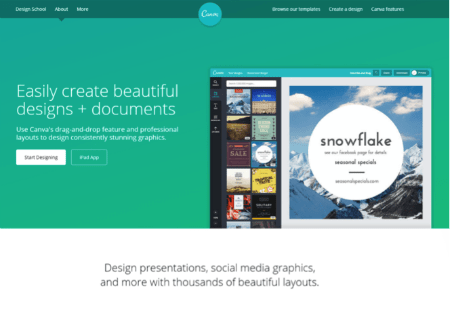 It features an inspiration wall, filters, text resizing and typography, and an auto recolor function. Canva is a very user friendly online tool that can take an image, and then allows you to add text to them in a variety of ways in order to customize the look and feel that you’re going for. There are millions of stock photograph images available for you to choose from, as well vectors and illustrations. To give your image a more customized and personal look, you can also upload your photos to use. Filters are also available so that you can adjust the look and feel of your image, along with some editing tools so that you always feel that you have flexibility. There are hundreds of fonts to choose from, as well as a selection of icons and shapes that you can incorporate within your image. 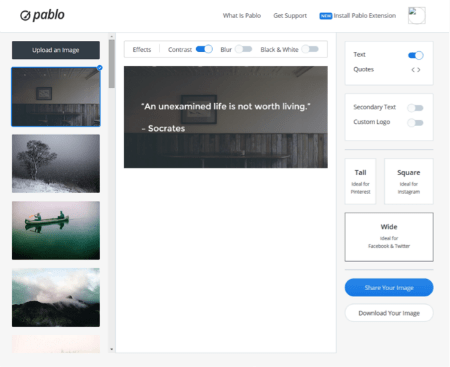 This tool can be used for creating image-quotes, banners and social media post images. 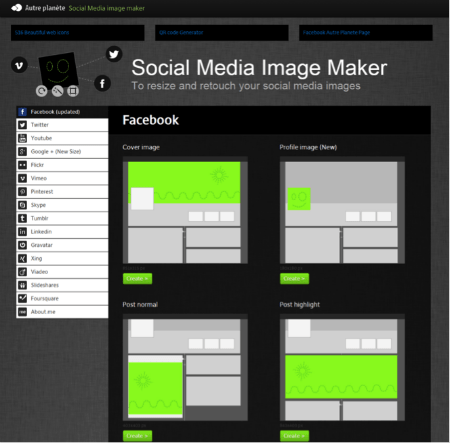 The social media scheduling tool Buffer created this image design tool. 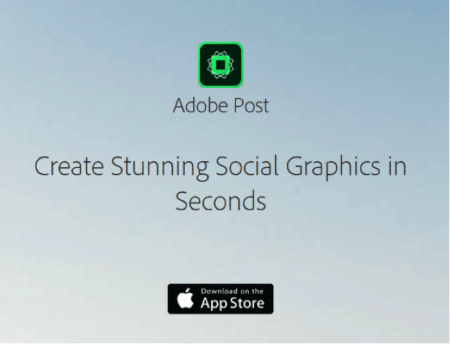 It was developed to help people create eye-catching images that fit all social media networks. It also has a browser extension to make things even simpler. There’s a limited number of images that they have available for use, but you can upload your own images and use the tool to format your visuals. It’s a very simplified tool, but it has features like contrast, blurring and converting color images into black-and-white images. This tool has a wide variety of features, but your ability to use all of them will cost you. There are 2 different versions of this tool, a Free version and a Pro version. A list of the features that this tool offers includes, instant color choices, auto resize text and images, easy drag & drop images, optimize for all platforms, SEO image automation, and an ever growing layout library. Need help in resizing your images so that they can work on different platforms? Check out this tool that helps speed up adjusting the image sizes. Social media marketing can be a very effective way in connecting your service or product with your audience and getting them interested to not just enjoy your product, but to better understand your business and what you and your business stands for. Using images and creating them with the right techniques and using the right tools can make your businesses brand even more appealing to current and potential customers. Be sure to check out part two of this series for additional insights on how to appropriately use filters and examples of top companies using images on social media that you can draw inspiration from. Or, connect with us and we can help you create a social media strategy to help you engage current and potential customers. 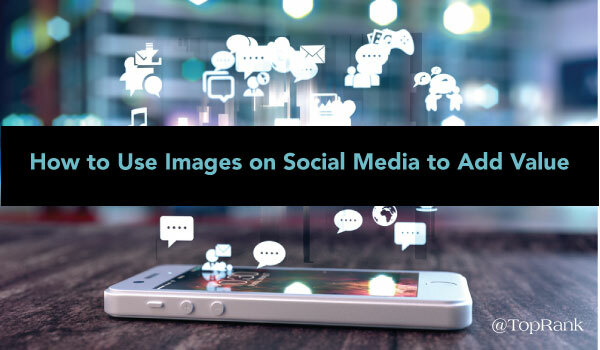 The post Social Media Images Part 1: Sizes, Best Practices and Tools appeared first on Online Marketing Blog – TopRank®. As the digital world we live in becomes increasingly cluttered, marketers are constantly refining their content marketing strategies and embracing new tactics to stay competitive. And Real-time video is one of those tactics that is allowing marketers to reach new audiences and increase customer engagement. Video has been viewed as an effective marketing tactic for a number of years. However, the time and resources needed to create quality video had many marketers focusing on other things. Fortunately, the introduction of real-time video platforms and applications such as Ustream and Meerkat now presents marketers with some fairly easy and cost-effective video content marketing options. And the launch of real-time video applications could not have come at a better time. Why? Because online video is one of the fastest growing mediums in history. According to HighQ, a leading-edge corporate software company, 78 percent of people watch videos online each week and 55 percent of people watch videos online every day. Much like your evening news broadcast, real-time video is a live video feed that disseminates content to an audience as it happens. When it comes to real-time video as a content marketing tactic, some of the most traditional examples are live webinars and podcasts. New technology and applications such as Periscope, Facebook Live, Blab and Google Hangouts are taking real-time video to a new level by offering user-friendly platforms for streaming the video. In addition, many of these platforms allow users to interact with the publishers through comment streams. Some of the ways real-time video can be used include: hosting a how-to demonstration for a product, interviewing current users on the benefits of a particular product or service, broadcasting live from events, or having a customer service representative answer commonly asked questions. Since real-time video is interactive, it allows brands to engage with customers almost instantly and creates more opportunity for discussion. The accessibility of real-time video apps means brands can produce quality content without spending a lot of money. On many platforms, the live video stream can be archived and turned into a permanent piece of video content that will continue to drive website traffic. Like any other piece of content, real-time video provides brands with the opportunity to expand and repurpose that content. Real-time video also means real-time insights. While video content is airing, you’ll be able to see how it is performing. There’s a risk of inappropriate comments slipping through since it’s hard to monitor all the users interacting with your content at once. Since the majority of these videos will be watched on mobile devices poor connection speeds or other technical difficulties could deter users from sticking around to see your content. From music to branded images, live video streams can unintentionally infringe on copyrights. 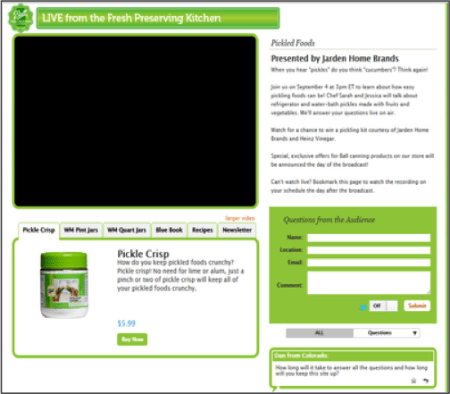 Ball Canning, the maker of the popular Ball canning jars, held a live video session demonstrating pickling best practices and a real-time Q&A. People were able to submit questions and receive answers in real time. Medium, a publishing platform for writers, was looking for a way to make itself more human and accessible—and video seemed like the perfect way to do just that. 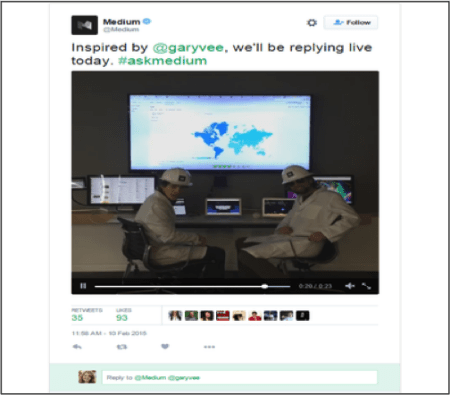 Users were able to tweet questions to the Medium’s User Happiness team with the hashtag #askmedium, and they received real-time video responses. General Electric (GE) was quick to experiment with real-time video. According to Practical ECommerce, in late March 2015 GE Creator in Residence and YouTube personality Sally Le Page held a behind-the-scenes interview with astrophysicist Neil deGrasse Tyson and scientist Bill Nye. 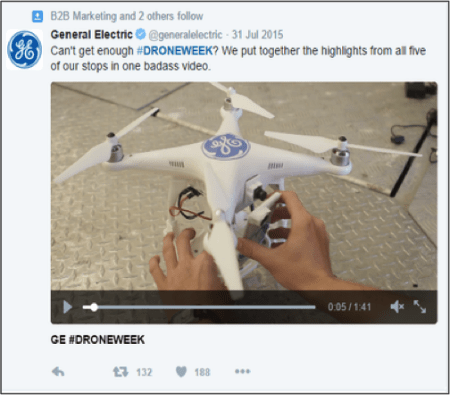 Then in July 2015, GE launched #DRONEWEEK on Periscope, broadcasting live video film by a GE-engineered drone flying from coast to coast. After the flight, GE took the videos and edited them into highlight videos. Do your research. If you decide that real-time video is a content marketing tactic that could benefit your overall marketing strategy, make sure you research the different platforms and applications. All have their own unique pros and cons. Create a plan. Like any marketing tactic, planning makes perfect. Outline the topics or products you’d like to showcase in your video, create a timeline for how the videos will be promoted and executed, and also make a plan for how you can repurpose the content later. Use existing content to get started. Repurposing content is a common marketing practice, and when it comes to launching a real-time video strategy, this is a great place to start. As mentioned above, some ideas include demonstrating how a product works or having a customer service rep answer commonly asked questions. Share something useful, interesting or compelling. This one is a no-brainer, but it still must be said. Video is like any other piece of content. It should provide the answers and information your target audience is looking for. Don’t make a video just to make a video. Be purposeful. Know your audience. Not every audience is primed for video. Make sure you understand your audience and determine whether or not they would benefit from real-time video content. Research your guests. If you’re planning on using Blab to conduct interviews or panel discussions, make sure your guest speakers are relevant and comfortable with the live aspect of the platform. Guide users to the next step. What do you want users to do when they’re done watching your video stream? Make it easy for users to find other content and continue to engage with your brand. Real-time video presents brands with the opportunity to engage with customers as if they were sitting across from one another. However, real-time video isn’t necessarily a viable content marketing option for everyone. Before you integrate real-time video into your content marketing strategy, analyze your audience and determine how and if real-time video can deliver the information they need, when they need it. What is your experience with real-time video? Do you have any favorite platforms? Tell us in the comments section below. Did you like this post? If so, check out our content marketing tactics index page with links to over 25 helpful posts just like this one! The post Content Marketing Tactics: Real-Time Video Pros, Cons, Examples & Best Practices appeared first on Online Marketing Blog – TopRank®. Does this influencer marketing scenario sound familiar? You’ve set up your initial influencer list full of high-profile names and a few up-and-comers in the industry, developed a compelling question for your outreach and just hit send on the first round. What went wrong? Did you have the wrong list? Is there a possibility that the outreach somehow didn’t get to the influencers? Or maybe you said something wrong? Influencer outreach has taken on a whole new meaning in 2016, and it has become crucial for brands to develop relationships with influencers. Getting the most from your influencers requires more than a simple email or InMail. You need to adopt an extended research and outreach process, cultivate the relationship, and continue it well beyond any campaign-related focus. Here are 4 questions that you must ask yourself to pinpoint why your influencer marketing initiative may not be as successful as you had hoped. #1 – Is this industry a good fit for an influencer-based campaign? It can be tempting to develop an influencer marketing campaign regardless of the target industry. But some industries are more receptive to influencer-based campaigns than others. It’s significantly based on the extent of content marketing currently available on the subject matter. If the target audience is already talking about your content topics, you can cull those resources for brand advocates. If they are unwilling (or unable) to discuss these topics publically, your outreach may fall on deaf ears. Here’s what to do instead: Identify a short list of influencers that can serve as a test outreach campaign. By using a small sample size of the larger audience, you can get a good feel for how the full outreach might develop. #2 – Was the influencer research aligned with the stated goal/objective of the campaign? This one’s critical. It can be tempting to grab high-profile names (chief executives, media celebrities, etc.) and add them to your outreach list. But unless you have a pre-existing relationship with those high-profile influencers, your outreach might get lost en route. Always refer back to the objectives of the campaign. Would your client be best served with a handful of high-profile names, or a dozen brandividuals with frequent interactions and audiences in social media? Here’s what to do instead: Segment your influencer list by job title. If you’re finding that most entries are at the executive level, consider identifying outside consultants and mid-level experts who can influence decision-making at higher levels. #3 – Did you reach out cold, or use a warm connection? If you’re going to reach out cold, you need a really compelling hook to grab someone’s attention. Remember – you want their participation, and they’ll need a good reason to offer it. If there isn’t a paid aspect to the influencer’s cooperation, a relationship becomes the incentive. Refer back to your campaign strategy – what do you want your influencers to do with this program? If it’s just a one-time participation ask, you might need to adjust expectations for both sides. Here’s what to do instead: Make yourself visible to the influencers before asking them to participate. Ask topic relevant questions on their personal blogs or industry groups, or connect with them on social networks and participation in an ongoing conversation. Not only will this warm up the eventual participation request, it will also give you context into their current topic focus. #4 – Did you ask for the moon? Your influencers are treasure troves of information, and it’s tempting to mine for every possible angle you can find. However, your influencers are also busy people – and if you make your proposals too complex, the may not have time to give a complete response. As you develop the outreach strategy, it’s essential to clarify how much you need from your influencers. Sending a five-part question (with three sub-bullets) might be less successful for an executive audience than a short, 1-2 paragraph description. 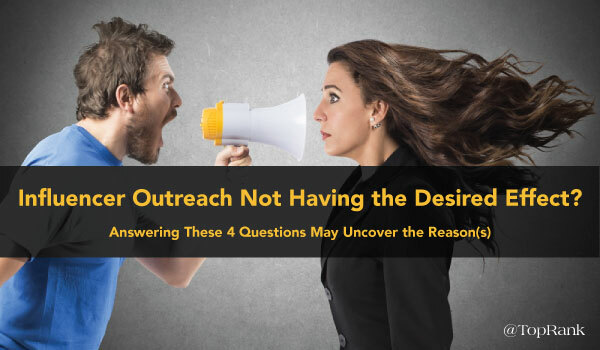 Here’s what to do instead: Tailor your outreach questions based on the level of warmth. If you’re reaching out cold, lead in with a short description and summary of the project. If the connection is warm, you have more clearance to present the full ask up front. If you’re influencer response rate can be summarized by the sound of one hand clapping, perhaps it’s time to reassess your outreach strategy. If you’ve found some success, what kinds of questions are the most effective for your programs? The post Having Trouble Connecting With Influencers? 4 Influencer Marketing Questions to Ask Before Your Next Attempt appeared first on Online Marketing Blog – TopRank®. A social media marketer walks into a bar. “I’ll have a Facebook martini,” she says. “What’s a Facebook martini?” the bartender replies. “It’s like a regular martini, but if I want to drink more than 2% of it I have to pay extra,” she says. Okay, so maybe comedy about social media marketing isn’t a great idea. But comedy and social media have a lot in common. They’re both fast-paced, harder than they look, and unpredictable. And at the heart of it, both are about telling a compelling story and making a human connection. I’m somewhat new to marketing, but have been in comedy—improv, standup, and storytelling—for over a decade. Much of what I learned entertaining audiences makes perfect sense for social media marketing. 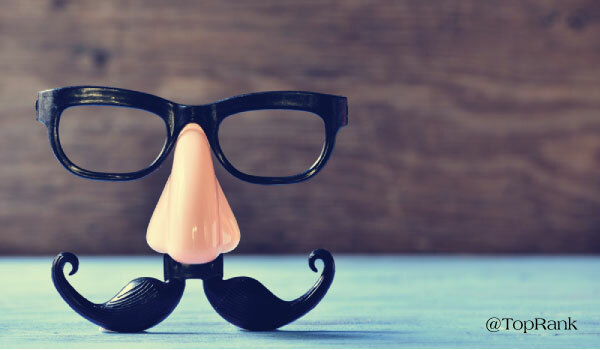 Here are five comedic principles you can apply to make sure your marketing efforts leave your audience wanting more. The most basic tenet of improv comedy is the “Yes, and” rule. It means you acknowledge your teammates’ suggestions and build on them. For example, if someone holds up two fingers and says, “I have a gun!” you don’t reply, “That’s not a gun; that’s just your hand.” You might get a laugh, but the scene falls apart. Instead, you would say, for example, “Hey, that gun was a gift from my grandmother!” To which your teammate replies, “She may be your grandmother, but she was my secret lover!” And the scene keeps building from there. Like improv, social media is a collaborative space where the lines between audience and performer are blurry. If your brand tries to control the conversation, your audience may tune out. You can engage more successfully by joining in on the conversation around your brand, acknowledging others’ contributions and building on them. If you analyze a really hilarious stand-up routine (I’m not saying I do that. Who would do that? That’s crazy talk), you’ll notice they have a structure built in. The comedian introduces a joke at the beginning, then refers back to it just when you had forgotten it, which prompts fresh laughter. The greats can do it multiple times during a set, to where the fact that he keeps calling back to the initial joke is just as funny as the joke itself. Callbacks work because they create a sense of community. The callback becomes an inside joke that only the comedian and the audience know. Even if it’s only been twenty minutes, that shared experience creates a bond. They also make the audience feel smart—one of my favorite comedians, Eddie Izzard, will say, “Well remembered!” when the audience laughs at a callback. To make your brand seem more human on social, make sure it has a memory. This summer, call back to a successful post from last summer. Take a customer reply with high engagement and turn it into an in-joke for those in the know. Remind your audience of your shared history, and you can foster a stronger sense of community. Heckling is an unfortunate reality for standup comedians. The smart move is to ignore the occasional shout from the audience—all the heckler wants is attention, and once you give it to them, they’ll only want more. If a heckler is insistent, though the other option is to directly engage, in a way that entertains the audience and shuts the heckler down. The rule of three is a classic structure for a joke. The first item in your list establishes a theme, the second leads the audience further into your theme, then the third has a subversion that provokes a response. “I only need one thing before I take up running: a full frontal lobotomy!” is a little bit funny, but the joke plays better once you have the audience engaged. At TopRank Marketing, we have a rule of three for messaging. The first message attracts attention, the second fosters engagement, and the third inspires a conversion. If we went all in on the first message, far fewer people would be willing to make the journey with us. But once you attract and engage, you have earned the right to ask your reader to take action. Nothing is more uncomfortable than watching a comedian who is desperate for the audience’s approval. They repeat the punchline, only louder. They say, “Is this an audience or an oil painting?” or “These are the jokes, folks.” If they manage to elicit a few chuckles, the audience is laughing at them, not with them. Great comedians have the confidence to let their act stand on its own merits, and know the audience well enough to change it up if a joke isn’t working. Asking for audience approval is just as cringe-inducing on social media. If a post fails to get the level of engagement you were looking for, pointing out the lack of engagement comes across as desperate. It’s better to move on: analyze why the post failed, research your audience, and try a different approach. Your audience won’t like your brand because you beg them to; they will like your brand when you deliver content that resonates. Good comedians know that comedy is more than standing up and telling jokes. If it were that easy, everyone would do it. In the same vein, social media marketers know there’s more to it than writing tweets and watching the engagement roll in. Both disciplines require practice, testing, and some innate skill. So let these comedic principles be the vermouth in your Facebook martini (callback), and you can make sure your audience stays entertained. Need to up your social media marketing game? We’re happy to help. The post No Joke: These 5 Comedy Principles Can Improve Your Social Media Marketing appeared first on Online Marketing Blog – TopRank®.